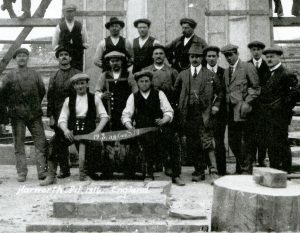 Sinkers at Harworth Colliery in 1914. On the board at the front it says England 1914. On the outbreak of WW1 some of the sinkers were arrested and interned at York Castle. The Anglo-German Northern Union Mining Company (NUMC) was registered in early August 1913. 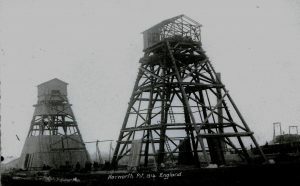 Its purpose was to sink and develop a new colliery at Harworth, including the development of a miners’ village at nearby Bircotes. 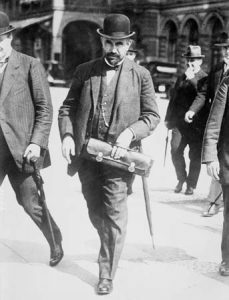 The NUMC took over the lease for 20,000 acres of land to mine coal which lay under the Galway Estates of Serlby Hall and was expected to incur an expenditure of over one-million pounds developing the new colliery. The Retford, Gainsborough and Worksop Times reported on 15th August 1913 that much of the money for the enterprise had come from Germany and that probably meant that most of the plant will be made there. The first Directors of the NUMC were Hugo Stinnes (Mulheim – Ruhr), Russell Ferguson—Chairman (London), Gustav Knapper (Bochum—Westphalia) and Arnold Lupton (Westminster). Mr J. H. W. Laverick of Tinsley Park Colliery, near Sheffield, was appointed local consulting Engineer and Mr M Waterhouse, latterly of the Hoyland-Silkstone Colliery near Barnsley, was appointed resident Manager and was to oversee sinking operations at Harworth. Reports in the local press suggested that the sinking would be carried out by a British contractor, employing British workmen. There were acrid comments made in the press about the dangers of admitting German industrialists into so British as institution as coalmining! 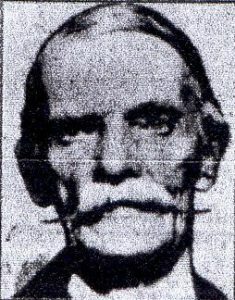 Arnold Lupton (1846-1930) – Mining Engineer, Academic and MP. Mining experts predicted that coal would be found at a considerable depth, in excess of 800 yards, similar to what had been found at the new colliery development at nearby Maltby Main, some six-miles distant. Russell Ferguson, Chairman of the NUMC, estimated that there was some 750, 000,000 million tons of coal reserves under the Serlby Hall Estates and anticipated an annual output from the new colliery of 1.5 million tons, a phenomenal output for a colliery at the time. This would give the new colliery a 500 year life! A temporary railway line was to be constructed from the Great Northern Railway’s main-line at nearby Scrooby, to enable plant and machinery to be transported to the new colliery site to commence sinking operations. A freezing process to keep water out of the shaft was adopted for the sinking of the shafts at Harworth, which was expected to start in early January 1914. German Mining Companies were the leading world experts on this type of sinking procedure, which had been adopted at the nearby development of Bullcroft Colliery, near Doncaster and was being used at Thorne near Stainforth. It had also been used for shaft sinking in the Great North-East Coalfield of Durham and Northumberland.